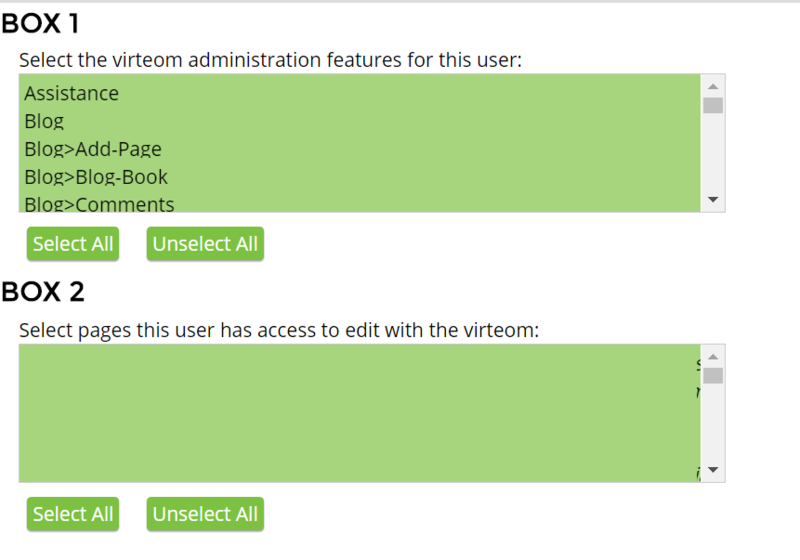 With Virteom, website administrators can choose which members have access to certain areas on the site. For example, you would want your blogger to have access to create and edit blog pages. You can make different levels of users, from customers and staff, to full admins. Let's get started. After logging in as an admin, select Dashboard (or Manager) from the top bar. Then, on the left hand side, select Members. This will bring up a screen showing all of the members who are registered to your site. You can also search for a member's name using the Search field. Click on Edit next to a member's name. Here is the user access part of the next screen. You can edit contact information, change a user's password, and update user access from this area. Box 1 is a list of all of the administration features a user has access to. In this example, this user has access to all features. Explore the list on your site and determine how you wish to set up access. Box 2 is a list of all of the web pages on your site. Again this user has access to edit all of the pages using the Editor section of the Virteom toolbar. In this way, you can select who has permission to edit certain pages of your site. If no pages are selected, the option to bring up the editor will not show. If you have any locked private pages on your site, you can quickly set up certain presets with the Member Types section under Members on the left hand menu. This will allow you to set up a list of permissions and save the member type to apply in the screen above. For example, you can set up a user type such as a customer, distributor or an administrator. Each user type can have different levels of access to private locked pages in your website. You can also set up different levels of administration this way. Also, selecting no options in box A, but selecting a few choices in box B will only give that user permission to edit those specific pages, without giving them any further access into your site. To the left of the boxes (shown above) is a long column with many form fields. This is where you add/edit/update user information such as password, company, address, member type and more. All you have to do to change any of these is simply type information in each field and click save. After changing any information, go test to make sure it was implemented correctly. For example, if you change your password, go logout and back in immediately to ensure the new password was saved. Allow certain administrators to have access to certain features in Virteom versus others.